On Sunday, the Commercial Appeal printed my letter to the editor, although they did not link it online. Today they ran a story called Group upset zoo took out 139 trees to build Teton Trek. It's a decent story, but the comments are rather distressing, although not that surprising considering the level of bile that is consistently spewed on the CA's site. They also have a poll "Should the Memphis Zoo have uprooted more than 100 trees to make way for a new exhibit?" At last count, 93 people voted yes and 91 people voted no. Today's Flyer also features a story on the Zoo's expansion (pg. 9). Some people seem to be asking, "What's the big deal?" or thinking, "The damage is done." 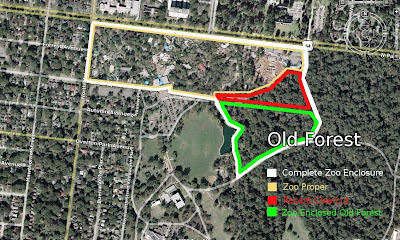 Well, the big deal is that the Memphis Zoo has 17 more acres (in green, below, courtesy of Gates of Memphis) of Old Forest on its property. As of now, there is a very loose plan to create a "Chickasaw Bluffs" exhibit on this site. However, the Zoo's master plan is being re-evaluated/re-designed in the near future. Without neighborhood and community input, this could mean that even more of the irreplaceable Old Forest will be destroyed in order to create artificial habitats. Or it means that we could demand that the Zoo return the 17 acres of Old Forest to the citizens of Memphis. If the Memphis Zoo is serious about a Chickasaw Bluffs exhibit, they should fund signage and other no-impact improvements for the entire Old Forest for people to enjoy free of charge. 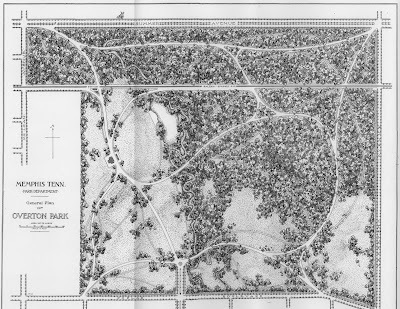 If you look at an old map of Overton Park, you can see that the entire Memphis Zoo site was once Old Forest. After years and years of slowly chipping away at it, there is no reason to trust that the Memphis Zoo will not continue to do so until there is no Old Forest left. To see the area that I am talking about firsthand, come to the Old Forest hike this Saturday, March 8th at 10:00a.m. Meet at the entrance adjacent to Rainbow Lake. And no, you don't have to be a "hippie" or a "treehugger" to come!